Following on from my last post, a new study by Locasun provides an interesting look at the comparative cost of skiing in 50 of the most popular ski resorts in France. According to the survey, the average cost of a week’s skiing varies between €400 and €800 per person when the cost of accommodation, ski lift pass and the hire of ski equipment are all taken into account. It turns out that, not only do the Pyrenees have fantastic, friendly resorts and varied skiing for all levels but they are also the best value ski resorts in France by a long way. The cheapest resorts in the study were Guzet Neige and Cauterets, both in the Pyrenees, each coming in at just under €400 each on average for one week of skiing. Another Pyrenean station, Les Angles, came in fourth lowest at €430 a week. 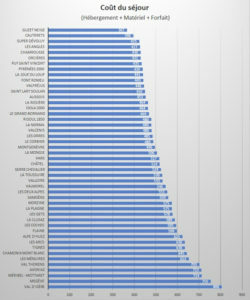 This is compared to the most expensive resorts which were Val d’Isère (€806), Megève (€755) and Méribel (€714). The study showed that, not only did the cost of accommodation vary substantially; between €549 (Guzet Neige) and €1,557 (Val d’Isère) but it was the same for the cost of ski passes. Similarly, the cost of ski and boot hire ranged from €49 in the Pyrénées to €128 in Val d’Isère. In the ski resorts here in the Pyrenees, we currently have the most snow and best ski conditions in Europe (or so I am told). 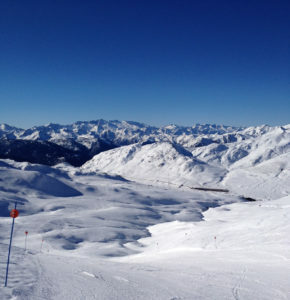 That is in the mountains however; if you are not a ski fan, don’t let that put you off. Here in the foothills and valleys it is 15 degrees and sunny right now which means that we get to enjoy the sunshine while looking at the snow against the blue sky in the distance. « French property for sale – what do the energy efficiency graphs represent?